I’m not sure about you, but when Black Panther is released next year, I’ll be at the theater at least five times to watch it. During Spider-Man: Homecoming, the trailer for the Marvel movie aired, and the gasps and applause that came from the theater were amazing. So you can only imagine what’s going to happen on opening night. On Wednesday, Entertainment Weekly got social media hyped when it posted its cover story for the movie, strategically right before San Diego Comic-Con. 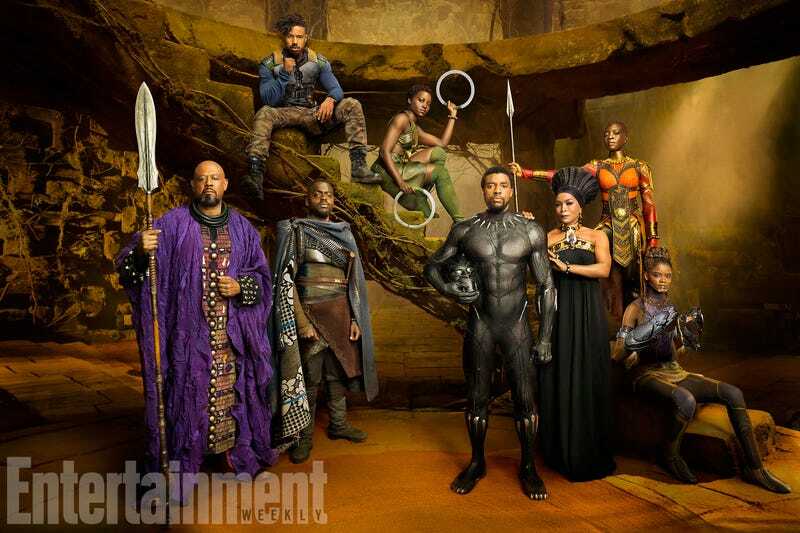 The Wakanda family-portrait article breaks down each character, and director Ryan Coogler gives insight into the movie and its main character, T’Challa, played by Chadwick Boseman. Of course, rounding out the cast is Angela Bassett, who plays his mother, Ramonda, once the queen, now the mother of the king; Wakanda’s undercover operative Nakia, played by Lupita Nyong’o; Letitia Wright, who plays T’Challa’s sister Shuri. There’s also Danai Gurira as Okoye, who heads Dora Milaje; Michael B. Jordan, who plays Erik Killmonger, who was known in the comic as N’Jadaka; and, finally, Daniel Kaluuya, who plays T’Challa’s best friend, W’Kabi, as well as Forest Whitaker as Zuri, a shaman and keeper of the Heart-Shaped Herb. The movie, which doesn’t open until February 2018, is already expected to break box-office numbers and will be the talk of Comic-Con.